Designing for a coastal site will always come with its challenges. On one hand, you need a design that protects itself and its residents from the elements. But on the other, you want a design that makes the most of the surrounding views. This was what Modscape’s Project Phillip Island home set out to do. Located on Victoria’s Phillip Island, the modular home is situated in a spot prone to harsh winds. Designed to provide shelter from the weather year-round, the four-bedroom home consists of two volumes – one clad in pacific teak timber, while the other clad in zinc. A courtyard – enclosed by a timber wall – boasts a pool; one of the several spaces to escape the wind. 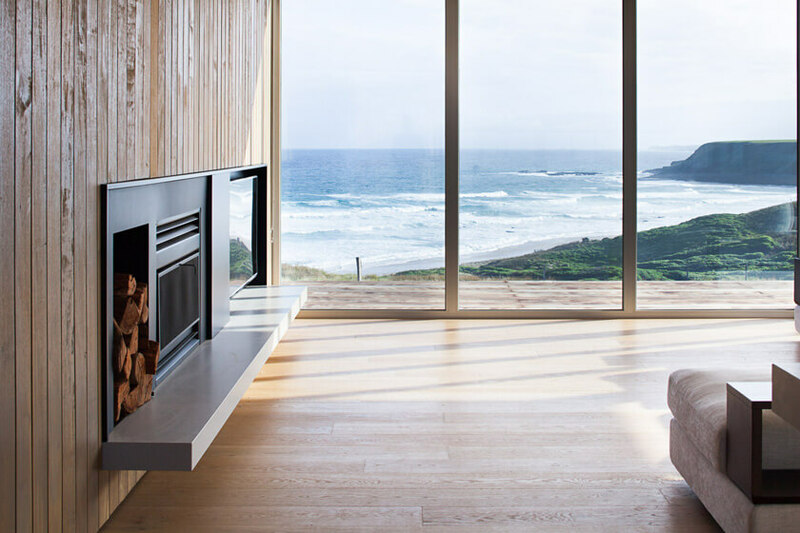 Although the home offers a retreat from these conditions, it doesn’t forget about the surrounding views – after all, the site overlooks Bass Strait. Inside, the dwelling is designed around a central kitchen, living and dining space. With floor to ceiling windows in this space, it opens up to views of the beach and headlands. The interiors also feature a simplistic colour and material scheme of predominantly whites, greys and timber finishes. And of course, a home like this wouldn’t be complete without a fireplace.